The Kingdom of Travancore in the Southern part of India was a native state in British India which was well known for its progressive outlook. Its enlightened royalty ruled the country as Sree Padmanabha Dasa. They had in place a well oiled administrative mechanism that implemented various programs and reforms, resulting in an overall development of Travancore. Though Travancore was under the colonial rulers, there was a well-orchestrated administrative machinery for coinage. Coins were minted as per the specifications ordered by the periodically issued Royal Proclamations. It is creditable that Travancore retained its independence in its functioning to a large extent. 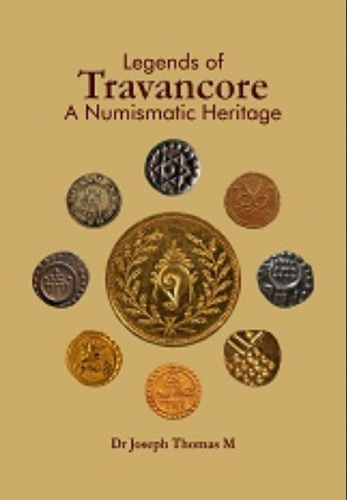 This book is an insight into the coins of Modern Travancore (from 1729 CE) which not only reflects the religious beliefs of the rulers, but also sketches the socio-political atmosphere of the period. Dr Joseph Thomas hailing from Thiruvananthapuram, is a Professor of Urology at Manipal University in India. His passion for collecting coins developed into a serious numismatic pursuit. His special area of interest is the study of the history of Venad and Travancore. Manipal University Press is a unit of Manipal Academy of Higher Education Trust and is committed to the dissemination of knowledge generated from within its vibrant academic environment and beyond.